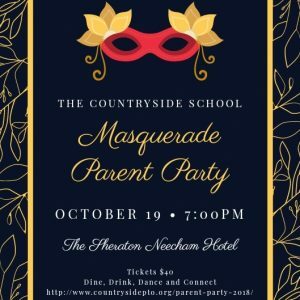 The Countryside PTO is pleased to announce this year’s parent party will be held on Friday October 19th from 7-11pm. This biannual event is always a fantastic opportunity to get together and celebrate as a community, and we’re excited to see you all there. This year’s party will be in the Grand Ballroom of the Sheraton Needham. Your ticket grants you access to the festive event featuring music, passed hot hors d’oeuvres, cash bar, games and giveaways. Join us for a night of fun, dancing, laughs and new friends! Ticket sales are closed. A limited number of tickets are available at the door. The PTO is looking for volunteers to help out at the party! Sign up here to help out! Q: How much do the tickets cost? A: Tickets are $40 each. A: Use the PayPal link above. Or pay by check made out to Countryside PTO and sent into school in your child’s folder. You will receive a conformation email once your payment is processed. A: The party will be at the Sheraton Needham located at 100 Cabot Street, Needham, MA 02494. There is ample parking at the Sheraton. Q: Do volunteers need to purchase tickets? A: Yes, we are buying tickets for the event, after all it’s for the PTO! We appreciate the help of our volunteers tremendously. We couldn’t do this without you! Q: I have a question not answered here!